The Lava Shortcode allows you to display a Lava template on any page that you would like. id The ID of the Lava template to display. refresh_cache (boolean) 0 for no, 1 for yes. Use this to force the shortcode to display live data. You can also find the shortcode when viewing the Lava post type. It’s will be listed under the Shortcode column. In addition to hand-typing the shortcode, we also have a button available in WordPress’s visual editor. 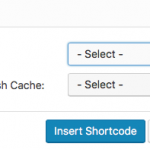 The shortcode button presents a dialog that allows you to auto-generate the shortcode by selecting a few options.